Researchers have identified a potent regulator of pain signaling, called ubiquitin-specific protease 5 (USP5), in sensory neurons. Published in Neuron September 3, the study found that USP5 cleaves ubiquitin groups off Cav3.2 calcium channels, thus preventing the channels’ degradation and expanding the pool of channels available for passing along pain signals to the spinal cord. Led by Gerald Zamponi at the University of Calgary in Canada, the researchers also found that USP5 is upregulated after injury in mice, and that disrupting USP5’s interaction with Cav3.2 channels provides relief in models of inflammatory or neuropathic pain. The findings suggest for the first time that ubiquitination—the cell’s system of flagging proteins for removal by adding ubiquitin molecules—can be harnessed to regulate pain. USP5 essentially cancels the order for removal and, in mammals, is one of about 90 de-ubiquitinases, about which not much is known. “If you looked up USP5 in PubMed, you aren’t going to get a lot of hits,” Zamponi told PRF. Despite this anonymity, USP5 powerfully influenced Cav3.2 channel expression, which dropped in dorsal root ganglion (DRG) neurons when USP5 was blocked. Cav3.2 channels belong to the group of T-type calcium channels that promote excitability and neurotransmitter release, and which are involved in pain signaling. “The more of these channels you have, the more likely you are to have pain signals,” Zamponi said. Currently, T-type calcium channel blockers are used as analgesics, but these come with side effects because they prevent the baseline function of the channels. To get around this, researchers have been looking for subtler ways to control the alterations in T-type channel number or function that occur in pain states. Last year, Zamponi’s group reported that glycosylation of T-type channels modulated their expression and activity in vitro (Weiss et al., 2013). Todorovic and colleagues also reported the same effect in vivo and found that reversing glycosylation of Cav3.2 channels in pain pathways reversed hyperalgesia in a mouse model of diabetic neuropathy (Orestes et al., 2013). The new study finds that cells also use ubiquitination and de-ubiquitination to control Cav3.2 channel activity. In particular, blocking USP5’s action on Cav3.2 channels seemed to remove the pain-promoting channels added after inflammatory insult or nerve injury. This could provide a state-dependent locus for drug development. “State-dependent drugs are a holy grail in pharmacology, in that they selectively target pathways or proteins that exhibit plasticity related to a particular disease, such as pain,” said Raj Khanna of University of Arizona in Tucson, US, who was not involved in the study. Khanna previously found an endogenous modulator for N-type calcium channels (see PRF related news story) and suggests that the mechanism discovered in the new study may also act on other channels or receptors involved in pain. “The study is a tour de force, and the findings may have far-reaching consequences,” he said. Zamponi and colleagues did not set out to discover a new analgesic pathway, but rather to find out whether T-type calcium channels were regulated by ubiquitination, as are L-type calcium channels (Altier et al., 2011). They were, indeed: First authors Agustin García-Caballero and Vinicius Gadotti found that Cav3.2 channels from mouse DRG neurons were ubiquitinated by an enzyme called WWP1, which added ubiquitin molecules to a short loop on the cytoplasmic side of the channel. Using this loop section as bait, the researchers then did a screen to find Cav3.2’s interacting partners. This nabbed USP5. USP5 proved to be a potent regulator of Cav3.2 expression. Knocking it down with shRNA resulted in decreased levels of Cav3.2 protein and halved the electrical current carried by Cav3.2 channels in cultured neurons. In vivo, USP5 levels rose after injuries resulting in chronic pain, either with injection of inflammation-inducing complete Freund’s adjuvant (CFA) to a paw or with a chronic constriction injury (CCI) to the sciatic nerve, which models neuropathic pain. Each condition resulted in hypersensitivity to touch, along with enhanced USP5 in DRGs and in the dorsal horn of the spinal cord. Knocking down USP5 provided some pain relief. For example, injecting USP5 shRNA intrathecally prior to CCI resulted in mice able to withstand more touch stimulation than mice receiving an shRNA to USP15, a control de-ubiquitinase. The effect wore off after 10 days, but a second injection could reinstate the pain relief, indicating that downregulating USP5 had both therapeutic and prophylactic powers. 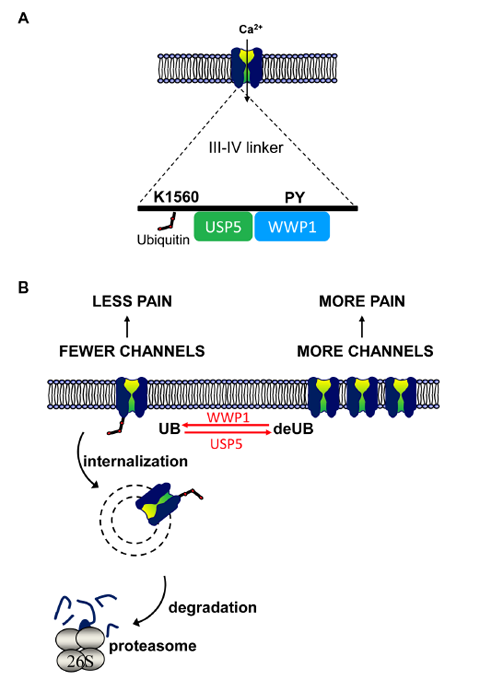 Uncoupling USP5 from Cav3.2 channels with a peptide also diminished pain. The peptide contained the Cav3.2 loop targeted by USP5 and sopped up endogenous USP5, thus preventing its action on Cav3.2 channels. When delivered intrathecally to mice that had developed touch hypersensitivity after CFA injection or CCI, the peptide increased their tolerance to touch. In contrast, the peptide had no effect on baseline pain thresholds, suggesting that it interfered only with channels involved in the pain state. Because peptides degrade quickly and are expensive to produce, however, Zamponi foresees only limited therapeutic use of the peptides used in these experiments. Instead, he advocates finding small molecules to interfere with USP5’s interaction with Cav3.2’s loop. He also has his sights on cell signaling pathways, which may instigate USP5’s upregulation after injury. “The cell has to be able to turn this enzyme on somehow,” he said. Image: Adapted from Garcia-Caballero, Gadotti et al., Neuron. Copyright 2014, with permission from Elsevier. Neuron. 2014 Sep 3; 83(5):1144-58. Neuronal Voltage-Gated Calcium Channels: Structure, Function, and Dysfunction. Reversal of neuropathic pain in diabetes by targeting glycosylation of CaV3.2 T-type calcium channels.